The new soccer pavilion at the IYU Recreation Reserve features an active facade that stretches playfully along the length of two premier soccer fields. The social space is positioned centrally along the fields to maximise spectator viewing and connectivity to both east and west soccer fields, whilst taking advantage of natural light through its full height glazed facade. The central social space allows clear views across both soccer pitches whilst providing protected platforms with its floating roof projecting out towards the fields. The pavilion encourages activity to all edges with access to change room facilities, social space and kitchen serveries along both sides of the building. Sustainable features are present throughout the facility including recycled water for irrigation and water closets, hard wearing low maintenance materials, cross ventilation through high-level windows and the use of low E, double glazed windows throughout. In addition, the floor plan provides flexibility, through openable change rooms to create larger spaces for other functional uses. IYU Soccer stadium addresses sustainability at the core of the design concept. 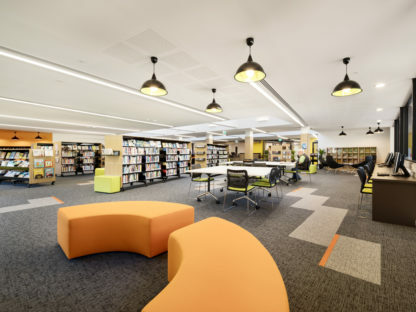 Natural lighting is evident in all areas of the building, with the use of light wells that provides lighting to internal spaces. "The pavilion encourages activity to all edges with access to change room facilities, social space and kitchen serveries along both sides of the building"